Hello! 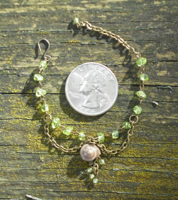 My name is Jesse - or Cat Spit - and I make doll jewelry. I'm a 30-ish guy with a longstanding interest in miniature crafts, particularly things that are one-of-a-kind and unique, or that incorporate natural materials such as wood, bone, and semi-precious stones. I... don't currently own any actual dolls that would be suitable for this forum, but my girlfriend does have some resin BJDs, which is how I got into doll accessories. Thanks, Bibarina! I'd actually like to get a few dolls eventually, when other factors aren't in the way (financial ones, but also, renovating a very old house... right now I have nowhere to safely display dolls where my cats couldn't get them, heh). I really appreciate the amount of work that goes into artist dolls and have admired them for years, being an artist myself. Maybe someday I'll be able to purchase from someone here! Oh I am with you on the renovations!! I have been at it for 2 years now, and still so much more needs to be done! I hope you find the doll of your dreams soon- but yes, if you go for porcelain you will definitely need a cat proof display! !